Every California school district, county office of education, and charter school must have a 3-year Local Control and Accountability Plan, or LCAP. How does your district plan to spend its state funding and serve all students? Do you have a plan to share? 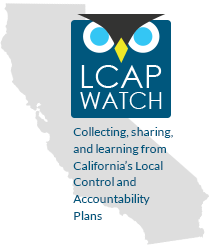 LCAP Watch is a repository for these plans and resources developed to help support districts and developing strong LCAPs.